The tickets for Jonsi at the Colston Hall were bought months ago on the basis of an album Ihad then yet to hear and which I still don’t know very well. As it turned out the show was the night of the first day back to work after the holidays and I was in two minds whether to go or not. The Lad and I did go though and to what must perhaps be the most astonishing gig I have been to. There are times when music is transcendent, taking you to another level of being (promise no shrooms were consumed), however fleetingly. These are the special moments, the moments when you are so absorbed, so transported, and in truth such moments are still rare. This was one of those nights. At times it felt impossible to take it all in – the music, the musicianship, the animations, lights and camera feeds all blending together. Its not often possible or appropriate to describe a concert as beautiful, but this was – the fallen-angelic falsetto, the melodies woven into sweeping sound-scapes, sometimes fragile and faltering at other times majestic and symphonic. To tell the truth I had little idea which songs were played (but I am assuming that the set list is pretty much as per previous shows as below, virtually the whole album plus a bit – which goes to show how rubbish I am at not recognising these extraordinary live versions). Whether he was singing in English, Icelandic, Hopplandish or double-dutch I wasn’t sure and it mattered not a jot. After buying the tickets I read glowing reports of the show and they were all true. You could see the show night after night and still get something new from it. The level of meticulous planning and preparation (by 59 Productions, see vid clip below) was amazing and of course necessarily made it far from spontaneous, but there was a completeness, a wholeness, carefully judged and precisely delivered and still in a manner that made it feel special despite the dozens of times they must have performed this set now. The video below gives a small sense of the intensity of the show, but is not able to properly pass on the actual experience of Grow Till Tall, the closer. A couple of years ago we, as a family, took a helicopter flight over Mount St Helens and into the caldera itself. I was so awestruck that I kept forgetting to breath out, amazed at what we were seeing. All be it in a different context last night too was breath-taking. A brilliant, uplifting and astounding show. 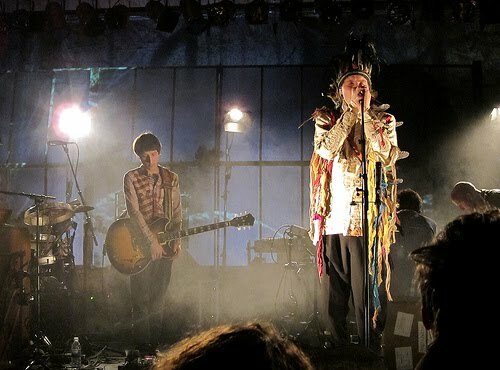 This entry was posted in Uncategorized and tagged Gig, Jonsi, video. Bookmark the permalink. i was there and yes, it was just wonderful.